Easy Rock Painting: Make Ladybug Rocks! With summer coming many of us see ladybugs everywhere. 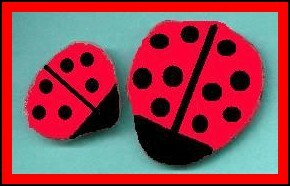 Why not create some special ladybugs you can keep on the porch or even inside in some special places? This is a fun craft that kids can do. They may need some help with putting the tape on to evenly paint a straight line, and you also may want to handle the permanent marker (for putting dots onto the ladybug) – but otherwise should be able to negotiate the project just fine on their own. – Rocks that can fit into the palm of your hand. Select oval or rounded rocks. Can use larger rocks if you wish to. 3. Take a piece of masking tape the width of your rock. We will now paint the ladybug’s head on. Place the masking tape on about 1/3 of the way onto the rock, creating a head. Now use your black paint and paint a head for the ladybug. Keep the tape on while the black paint is drying. Remember: by using the masking tape, you are creating very clean and even lines. Your ladybugs will have a very tidy look to them. 4. Next we will create the black stripe down the ladybug’s back. Take two pieces of masking tape and put them on the ladybug’s back, allowing for a thin stripe of red between them. Depending on how large your rock is, this could be 1/8th of an inch or even 1/4 of an inch. Paint this stripe black and allow the tape to remain on until dry. 5. Now it is time to draw dots on the ladybug’s back. You can use paint or even the permanent marker. It is your choice. Most ladybugs have many dots, but if your rock is small then you will probably want to put only three or four spots on each side of the ladybug’s back. Leaving space for the red to show through and provide contrast to the black dots is best. Once this is dry you are done!